Two major factors in deciding the value of any automobile accident case are liability and damages. Damages, which we’ll discuss in a later post, include things like medical bills, lost wages, pain, suffering and incapacity. Liability is used (often incorrectly) by lawyers to refer to negligence. In some cases, lawyers might tell the judge or jury that they have conceded liability, which is taken to mean that the defendant admits to being negligent. Technically, if a driver is liable, he was negligent, and his negligence caused damages. However, in some cases, a driver may admit negligence, but argue that his negligence did not cause damages. So, though lawyers sometimes use the terms liability and negligence interchangeably, we’ll use the correct term “negligence.” Negligence is simply a fancy way to describe fault. A negligent driver is one who caused the accident–it’s as simple as that. 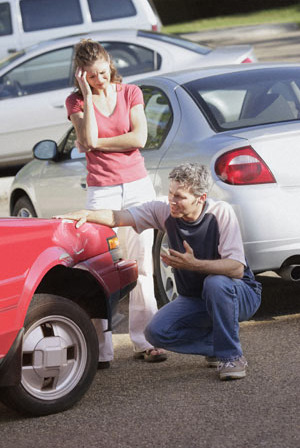 So, why is negligence important in determining the value of your car accident case? Why is it important in your ability to get an accident settlement, or to convince a judge or jury that you were wronged? The reason is that a case with clear negligence is a simpler case–the only thing you need to prove is causation and damages (that is, you have to prove the at-fault driver’s actions caused your injuries). A case with clear negligence is usually a winner, and the only issue is how much you will win. However, if negligence is harder to prove (or, if the victim may have also been negligent, called contributory negligence), then it makes proving your case harder. Not only do you have to fight causation and damages, but you must also fight to prove who was at fault. If negligence is easy, lawyers will typically take most cases, even if the damages are minor. Lawyers often analyze difficult negligence cases on a sliding scale. If proving negligence is hard or unlikely, we won’t take minor damages cases. However, if negligence is difficult to prove but the damages are extensive (say, a broken bone, or some level of permanent injury), then we are more likely to accept the case. In those cases, the potential rewards may exceed the risks. Victim’s car was rear-ended by another vehicle. This is usually a good negligence case, and most lawyers would take it regardless of what the damages are. Victim’s car went through a green light intersection, and the negligent driver ran a red light, causing a T-bone collision. Damages include an ER visit and 5 visits to the physical therapist. If there are no independent witnesses, and no traffic camera video/photographs, then most lawyers will not accept that case. Victim’s car went through a green light intersection, and the negligent driver ran a red light, causing a T-bone collision. Damages include a broken leg, 2 days in the hospital, and a surgery, with 3 months of physical therapy. If there are no independent witnesses, and no traffic camera video/photographs, then many lawyers will accept the case. In court, it’s all about what you can prove. We all know that some people will remember the facts of an accident incorrectly, and some people will lie to protect themselves (or their insurance companies). The victim has must prove his case, and must prove that the other driver was more likely negligent than not. If you can do that, and if the insurance company knows you can do it, your case is more valuable. If there is a question about whether you can do it, any settlement offers will be discounted because of the chance that you may lose the negligence argument.